I finally have a blouse with metal collar tips! I don’t know why I’ve never had one of these. I find these little details really cute actually, especially on my top’s huge collar. To match my collar tips, I paired my top with gold trousers. These gold trousers are actually pretty tame. They’re not the kind of gold that make you want to go dance the night away. 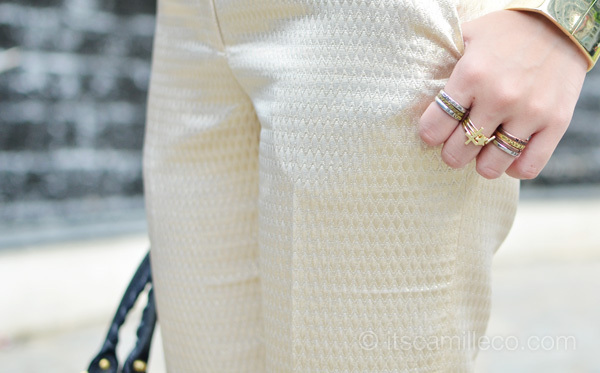 They’re more of the “let’s talk business” type of trousers–perfect for my day full of meetings! 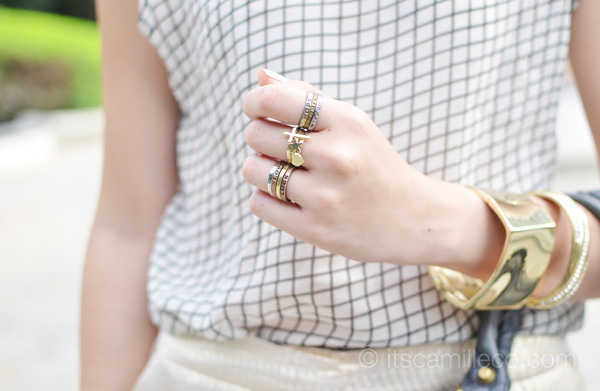 I love these rings! It’s nice to see inspiring and encouraging words throughout the day. Another item to get me through the day? My trusty Skullcandy INKD earphones. It’s nice to listen to music as I wait for my next meeting. I totally intended for these to match with my outfit by the way. Haha! You can never go wrong with black and gold. Sleek as ever! ..and you’re the golden girl! this outfit suits you just well: chic, innocent, formal… all in one package! simply cant put it into words! it’s beyond awesome! Love this whole look! Such a nice wearable gold trousers. Can I ask for some advice. I have this orangey Zara blazer that I bought a week ago (you probably see these in ZARA racks), I don’t have any idea how to style it since its almost Spring season now here in Australia. Can you suggest how I can style it in different ways. Thanks! I love this “golden” one but ofcourse I love all your posts, I find your style very tasteful so I check your blog every week =) ms.camille, I need contact lenses but I want stylish ones, I need to go get my eyes checked and maybe they’ll adjust my eyeglasses so before I go I want to have the best idea of what brand and color should I get for contact lenses instead, can you help me?? I see you wear good ones. Thank a lot. I used to be scared of wearing gold. It looked like it makes me look old or it’s for more mature peeps, not for the young ones. But then it has become a trend too and with you wearing it with this style, makes it even more loveable and not something the youth would be guilty to wear. :) Glam lang ang dating hehe. I’m a huge fan of your top! It’s so pretty and yet so perfect for a business meeting. Ate Camille :) I looove the outfit and stuff and especially the rings . You make me say WOWWWWWWWWWWWWWWWWWWWWWWWW! Endless wow! :o You have a mole at your left eye? 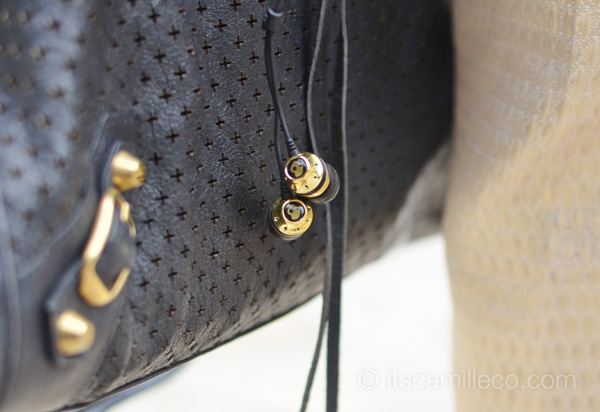 Hi Ms. Camille, where do you buy your balenciaga bag? Thanks! :))) Nice outfit! Always classy. Cute! I used to live in Manila but based in LA now. :) I miss the Philippines! I love looking at your photos because I get to see the new changes in the city. Love the black & gold combination! One of my most favorite outfits of yours. If I weren’t pregnant, I’d get the whole outfit! I guess I can settle with accessories at least – I do like SM. I’m here in Manila for a short vacation and went to SM a few days ago and scored a nice collar necklace. Not bad for $7. SM is so affordable! I’m glad you liked it! :) Thanks Dianne! What a great outfit! !Love it!! And yes to music! It keeps people with busy lives sane!! In fairness to you! :) Thanks Mark! i really adore your Lanvin booties… although you over-used it from your previous post… until now, it still looks like it is the first time you use it…. Aww thank you Mica! These shoes are full of scratches already but I’m trying my best to avoid adding more! Oh this outfit is soo gorgeous!! I like! Love the top! 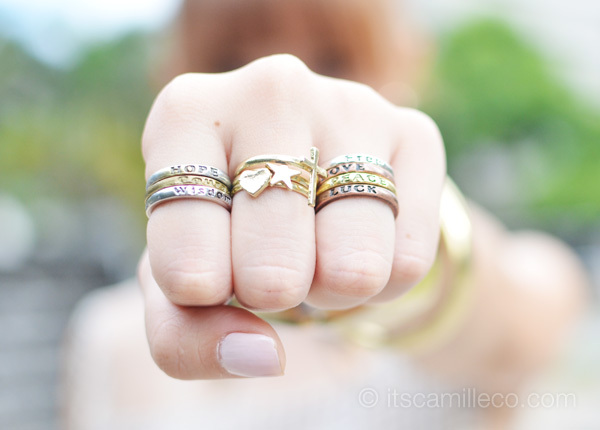 I want those rings! Haha. Great outfit! You are really pretty, I don’t know why you’re not a supermodel! Because I don’t look like one haha! :) Thanks Lauren! I love your outfit. :) Btw!!! I’m so happy when I knew that you, ms tricia G and mas laureen is on the cover of preview mag sept issue. Oh yay!!! I will definitely grab one :’) Congrats!! OH GOD. My jaw dropped when I saw your Preview cover! OH MY GAAAAAD! Need to rush to the nearest bookstore! And you girls are wearing Cary Santiago! I LOVE CARY SANTIAGO! You better share your whole Preview experience really soon! haha! This is another milestone for you! I got carried away…I did not even bother to look at your outfit first before commenting! haha! It’s very pretty though. Love it all especially your pose in the 2nd photo! Lakas maka-model ng pagkakabukaka ha! OMG! I’m really so excited to see your Preview spread! I might get to see more bukaka poses! haha! Is your photographer always kneeling when taking your outfit shots? Love your trousers! Btw, im curious.. Does sm gold accessories tarnish? Thanks! Well, mine haven’t :) Thanks lucy! oh my. that`s why you`re my fashion icon. haha. :))) you look good. and I love your rings! Yes! :) Haha thanks Tricia! i love this look. it’s match to my profession. :-D Thank you. oh, I love that trousers too! so pretty! pretty!! i love this match.. Your so beautiful!.. I love everything! God bless! Love ur trousers! I want to steal them their so pretty!